You can easily set limits for the total responses received for your survey and/or for the number of responses received from each user. Note: Response limits only refer to completed responses – limits may not be imposed on incomplete responses. On the General tab, you will find fields to set the total response limit (total complete responses you want to allow) and the per respondent limit (number of complete responses per user you want to allow. You can set one or both limits, keeping in mind that the total response limit must be equal to or greater than the per respondent limit. Click Save. Note: It is not recommended that you change response limits while your survey is active. Total response limits can be enforced regardless of the permissions settings for your survey. 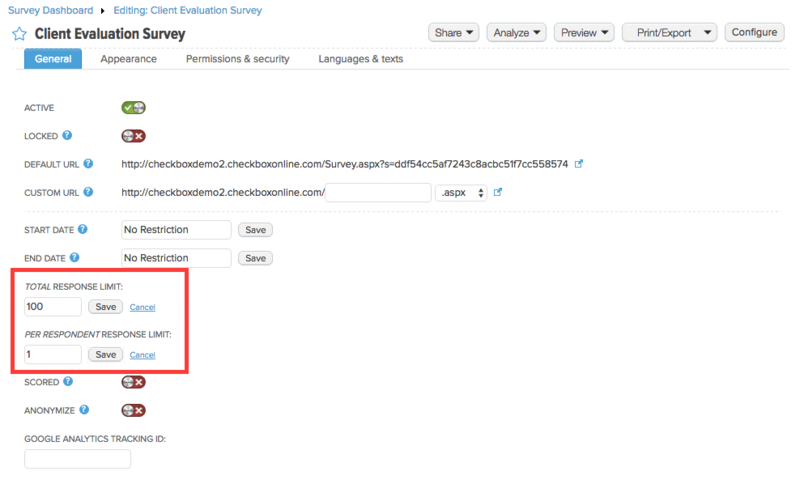 However, in order to enforce a per respondent limit, Checkbox needs to know who your respondents are in order to ensure they only submit one complete response. This means that, if you want to set a per respondent limit on your survey, your survey cannot be Public or Password Protected since neither of those permissions options tracks usernames or emails. While still in the survey settings area, click the Permissions tab. 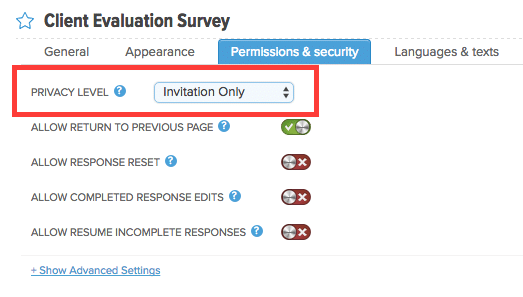 If you would like to enforce a per respondent limit, choose Access List, All Registered Users, or Invitation Only for your survey permissions setting. If you are only setting a total response limit, you may choose any permissions setting. For more information on survey permissions, see our Survey & Folder Permissions Guide.